Eales’ disease, first described by the British ophthalmologist Henry Eales in 1880, is characterized by three overlapping stages of venous inflammation (vasculitis), occlusion, and retinal neovascularization. Diagnosis is mostly clinical and requires exclusion of other systemic or ocular conditions that could present with similar retinal features. 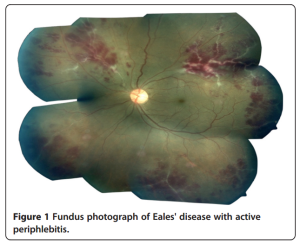 In recent years, immunological, molecular biological, and biochemical studies have indicated the role of human leukocyte antigen, retinal autoimmunity, Mycobacterium tuberculosis genome, and free radical-mediated damage in the etiopathogenesis of this disease. However, its etiology appears to be multifactorial. The management depends on the stage of the disease and consists of medical treatment with oral corticosteroids in the active inflammatory stage and laser photocoagulation in the advanced retinal ischemia and neovascularization stages.